This commencement will be AU's 133rd. 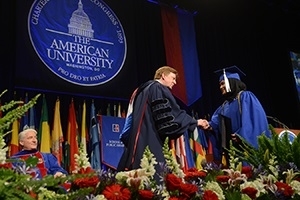 American University will hold to tradition and host its 133rd commencement ceremonies on Mother’s Day weekend. The ceremonies will take place in AU’s Bender Arena and feature an impressive roster of commencement speakers who will offer advice and congratulations to roughly 3,500 graduates. AU’s 2017 commencement speakers demonstrate compassion, integrity, and unwavering commitment to public service. Individual school ceremonies will be held on May 13 and 14, followed by a ceremony for the Washington College of Law graduates on May 21. The Honorable Patricia Harrison, President and Chief Executive Officer of the Corporation for Public Broadcasting (CPB), will address the graduates of the School of Public Affairs at 9 a.m., Saturday, May 13. Honored for her commitment to diversity, Harrison established the first Diversity and Innovation Fund for public media—radio, television, online and mobile. Under her leadership, CPB launched American Graduate: Let's Make It Happen, a nationwide public media initiative to help communities across the country identify and implement solutions to the high school dropout crisis, and has been named to the Forbes list of “Women Changing the World in Media” for her efforts to empower women and girls globally. Ms. Harrison has served as Assistant Secretary of State for Educational and Cultural Affairs and Acting Under Secretary for Public Diplomacy and Public Affairs, and she is the author of two books, A Seat At The Table: An Insider's Guide for America's New Women Leaders and America's New Women Entrepreneurs. The Honorable Patricia Harrison, an alumna of American University’s College of Arts and Sciences, will receive an honorary Doctor of Public Service degree. Sir Howard Stringer, former President of CBS and former CEO of the Sony Corporation, will address the graduates of the School of Communication at 1:30 p.m., Saturday, May 13. As long-time journalist, news producer, and head of CBS News, Stringer may be best-known for bringing David Letterman to CBS. Mr. Stringer has been a recipient of the First Amendment Leadership Award from the Radio & Television News Directors Foundation and the Visionary Award for Innovative Leadership in Media and Entertainment from the Paley Center for Media. He is a member of the Broadcasting and Cable Hall of Fame. Sir Howard Stringer will receive an honorary Doctor of Humane Letters degree. Patricia Q. Stonesifer, Volunteer President and CEO of Martha’s Table and Lead Director of the corporate board of Amazon.com, will address the graduates of the College of Arts and Sciences, at 6 p.m., Saturday, May 13. After more than twenty years as a leader in the technology industry and the next twelve years building the world’s largest foundation, Ms. Stonesifer joined Martha’s Table in 2013 to help America’s neediest youth and their family members. Ms. Stonesifer has been a leader in the philanthropic world since 1997. As founding CEO of the Bill and Melinda Gates Foundation, she distributed more than $2 billion annually to public-private partnerships working to improve the health and welfare of vulnerable populations in the United States and abroad. She serves on the board of the Smithsonian National Museum of African American History and Culture, and, in 2010, was appointed by President Barack Obama to serve as the Chair of the White House Council for Community Solutions. She served as a member of the U.S. delegation to the United Nations General Assembly Special Session on HIV/AIDS. Ms. Stonesifer will receive an honorary Doctor of Public Service degree. Carlos Carrazana, Chief Operating Officer and Executive Vice President of Save the Children Federation, Incorporated, will address the graduates of the Kogod School of Business, at 10 a.m., Sunday, May 14. Prior to joining Save the Children, Carrazana served as a Vice President of the International Health Division at Abt Associates Inc., a global human development organization, and spent more than 20 years in the commercial banking sector and in international health. Mr. Carrazana served as the Director of the Summa Foundation at Deloitte Touche Tohmatsu's emerging markets division, as a Director of the NIH-funded National Initiatives on Cancer Project at the University of Miami School of Medicine, and as a Director of the CDC-funded M-Powerment project, an HIV/AIDS prevention and voluntary counseling and testing program. Mr. Carazzana is an alumnus of American University's Kogod School of Business and he will receive an honorary Doctorate of Laws degree. Lakhdar Brahimi, former United Nations Special Adviser to the Secretary General, will address the graduates of the School of International Service, at 2:30 p.m., Sunday, May 14. A former Minister of Foreign Affairs of Algeria from 1991 to 1993, Brahimi is one of that country’s most prominent diplomats and negotiators. Mr. Brahimi served as the U.N. Special Adviser to the Secretary General in 2004-2005. He was Algeria’s Ambassador to Egypt and the United Kingdom, and helped to negotiate the end of the Lebanese civil war as an Arab League official. He also oversaw the U.N. Observer Mission during the 1994 election in South Africa, helped to end Yemen’s civil war that same year, and has led the U.N. initiatives in Haiti, Afghanistan, Iraq, and across Africa. He is a member of The Elders, a group of retired Statesmen created by the late South African President Nelson Mandela, and a member of the Global Leadership Foundation, founded and chaired by F.W. De Klerk. Mr. Lakhdar Brahimi will receive an honorary Doctor of International Affairs degree. Bryan Stevenson, Founder and Executive Director of the Equal Justice Initiative (EJI), will address graduates of the Washington College of Law at 1 p.m., Sunday, May 21. Mr. Stevenson, a member of the New York University School of Law faculty, has spent more than three decades representing capital-case and death-row prisoners across the American South. His work has won him national acclaim, including the prestigious MacArthur Fellowship Award Prize in 1995, the ACLU National Medal of Liberty in 1991, and the Olaf Palme Prize for international human rights in 2000. In 1996, the National Association of Public Interest Lawyers named him the Public Interest Lawyer of the Year. He is the author of the New York Times bestseller Just Mercy, which won the 2015 Carnegie Medal for Best Non-Fiction, the NAACP Image Award for Best Non-Fiction, and was named by Time Magazine as one of the 10 Best Books of Nonfiction for 2014. Bryan Stevenson will receive an honorary Doctor of Laws Degree. More information on the speakers is available on AU’s commencement website. Students, alumni friends, and family will be tweeting using the hashtag #2017AUGrad. Those who cannot attend the ceremonies will be able to watch a live stream of each ceremony on AU’s commencement website.